For the full effect, click to enlarge; for more Wordless Wednesday, click here. Nice shot - Reminds me of the arches at one of our historic restaurants, which the new owner took great pains to preserve during the renovation. This is perfect for Voyeurs, though we can't see inside. :) I really like the unique shape of this window. That definitely has an eerie feel to it. love the shape, very cute. OK that just gave me the shivers. That is spooky. But I do love the window! Very cool window! It's eerie. I love windows and doors. When I share my photos, people ask about some special significance, and I'm reduced to mumbling, "I just thought it was a cool window." I'm glad to see that others share my obsession! I'm a nut for doors and windows, and this one is fascinating. Great shot! Looks like your ghost is brushing his teeth! Great window. A terrific mood for this time of the year. I wouldn't have noticed that until I enlarged it. Rather gothic looking. Very spooky, you can just see it there! What an awesome photo! Spooky! Are you sure that isn't a real person?????!!! Holy smokes! That's kinda creepy. Great photo. This is a very creepy shot - love it though! Aww! 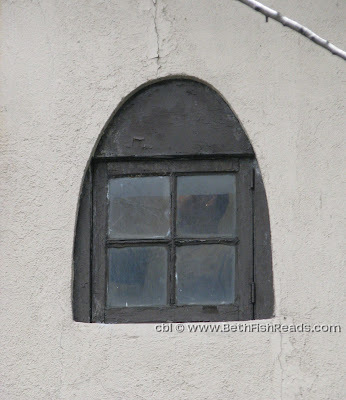 I think that's a cute little window, if slightly creepy. I love it! I can never resist old windows when I am out with my camera.